1) Custom headcover – Getting a personalized, custom headcover really shows that you know the golfer and the teams that they support off the course. Rocket Tour makes high quality headcovers in all color combos and all sizes. Before ordering, check the colors of the golfer’s bag and get a headcover that will match. 2) Tickets to a Major Championship – Going to a regular golf tournament can certainly be a thrill but attending one of the major championships in golf is a memory that will last a lifetime. Each year, there are 4 chances to go to a “major”. Below highlights the 4 majors and where you can find out more about getting tickets. 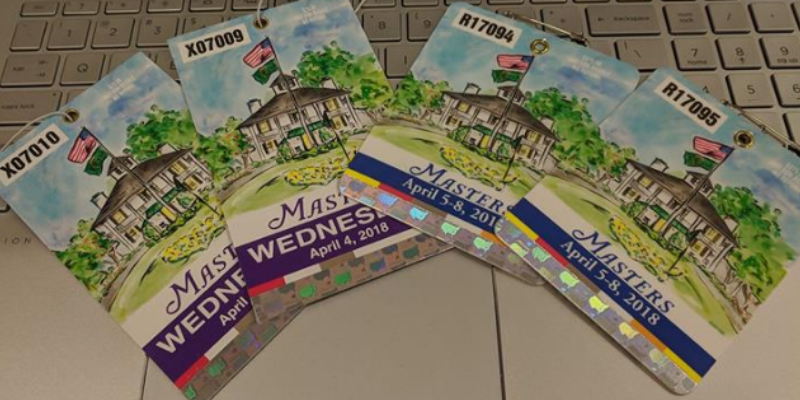 The Masters – The hardest ticket in golf. It always takes place at the same golf course called Augusta National Golf Club in Augusta, Georgia every April. The PGA Championship – This tournament is the 2nd major of the year and takes place each May at different golf courses across the country. US Open – This golf tournament always take place on Father’s Day weekend in June. It would be a great gift for a dad to attend a US Open on Sunday! The Open – This tournament always takes place in Europe and can shift countries where it is held. Most often this tournament is held either in the UK or Scotland. You might need to plan a bigger golf trip if you are planning to buy tickets to The Open. 3) Golf Club Labels – Buying a set of golf clubs is certainly an investment! Given avid golfers play a lot of golf, the chances of losing a club on the course can happen at least once per year. Since there are only about 10 major golf companies in the world, many people have the same type of clubs. Put your name on your clubs! It’s simple, easy, and cheap. You won’t regret it the next time you lose one and you get a call from the course with your lost club. 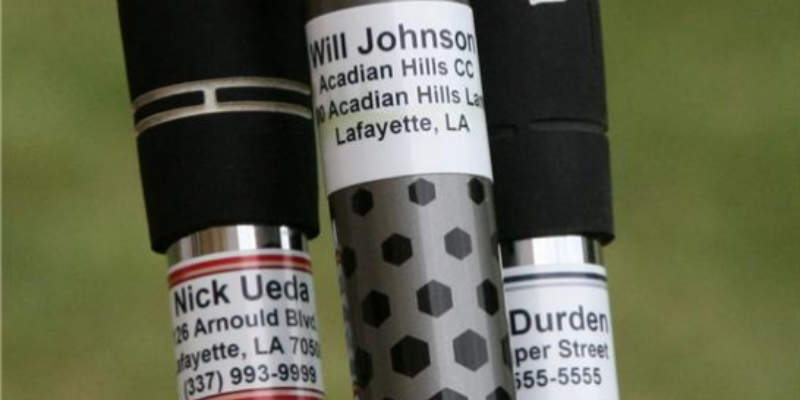 There are many places to order custom labels such as Vistaprint or MGgolf. 4) Golf Pencil Holder – Avid golfers play many different courses around the country and often are proud when they play a fantastic course. Although displaying pictures from all these nice courses would be neat, my spouse would never let me put up so many pictures in the house. Every golf course gives a scorecard and pencil to players. 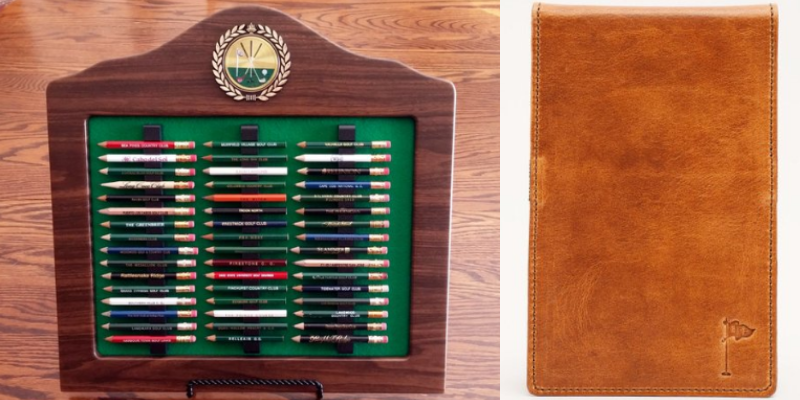 Encourage your avid golfer to start collecting pencils from awesome golf courses and display them in the pencil holder you get for them as a holiday golf gift. Here is an example of a pencil holder I found on Etsy. 5) Custom golf scorecard holder – If you watch the PGA Tour, you will often see the pros pull out a scorecard holder book from their back pocket which has information on the course and their scorecard for the round. Since having a scorecard and pencil will never change, getting your avid golfer a custom scorecard holder is a great idea for a golf gift. You can try to find a cool USA scorecard holder like Patrick Reed uses in the Ryder Cup or nice leather one with your initials. There is a company called Bluegrass Fairway who seems to have some great options and many positive reviews. Hope these gift ideas provide some inspiration for an awesome golf gift for the avid player on your holiday shopping list.